Comfort eating is a habit and is controlled by the unconscious mind. Hypnotherapy enables direct access to the unconscious mind, to enable a change to the old eating habits and to resolve any emotional reasons for over-eating. There is a reason why the problem started. Your unconscious mind holds all your past memories. By accessing your unconscious it is possible to identify the cause of the problem and help you release the negative emotions connected to it. You may have experienced dieting in the past. If so, you may know that feeling of giving up something enjoyable while you are dieting. There are a variety of weight loss diets around, and they generally don’t work. This is because they usually involve depriving yourself of certain foods in order to lose weight. But for many people diets are not a permanent solution, because as soon as the desired weight is achieved they go back to their old eating habits. Most of us over-eat due to emotional or habitual reasons, i.e. we eat to satisfy our minds rather than eat because we physically need the food to survive. It may be that you eat when you are bored or stressed, or maybe you believe you eat healthily but you eat too much – there is a reason why you do so. 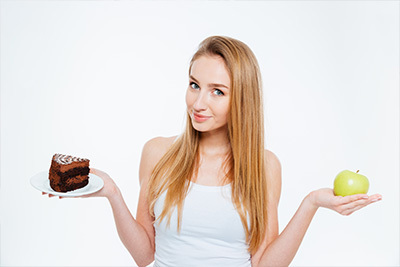 Hypnotherapy can allow you to have a change of attitude towards the food that you eat. So that you no longer want to snack on crisps or chocolates, or finish everything on your plate even if you are not hungry. This enables you to enjoy eating healthily and at the same time lose weight in a safe and natural way. The number of sessions depends on the cause of the weight problem and the client’s response to the hypnotherapy. Some clients only need three or four sessions, others may require more if they need to resolve past emotional issues surrounding the weight problem.